On their honeymoon, or even a typical episode of How I Met Your Mother, Robin standing over a handcuffed Barney may not have come as such a shock. 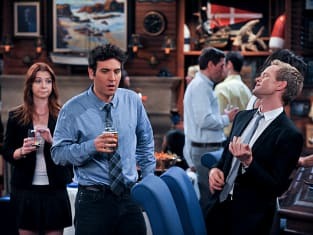 How I Met Your Mother Season 9 Episode 12 centered around the couple's rehearsal dinner, however, so suffice it to say he had plenty of explaining to do. Of course, Robin didn't find Barney handcuffed to a bed or a woman under shady circumstances, things that would've been par for the course years ago. He was merely in the security office of a laser tag place. Obviously. It all turned out to be a surprise rehearsal dinner in the future bride's honor as Barney did his best to bring Canada to Robin. Not a bad stunt there, eh?